Clerestrory windows above the piano add even more light to the already luminous space. 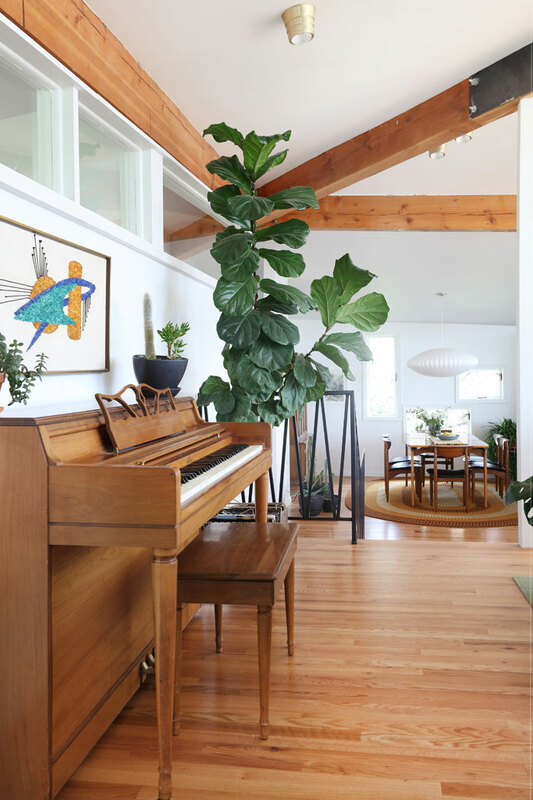 The high ceilings allow for this tall plant to make a statement. The dining area and kitchen are down a few short steps, on the other side of the entry. Just a week after moving in, the happy news of Danielle’s pregnancy meant that renovations needed to be tackled quickly. “The very first thing we did was rip up the carpet. It was old and needed to be done,” says Danielle. Drywall was repaired and flooring throughout the house was redone in “red oak common #1,” a popular hardwood choice during the midcentury. Danielle and Cole were living downstairs while tackling upstairs renovations mostly by themselves, with Cole’s father acting as the general contractor. 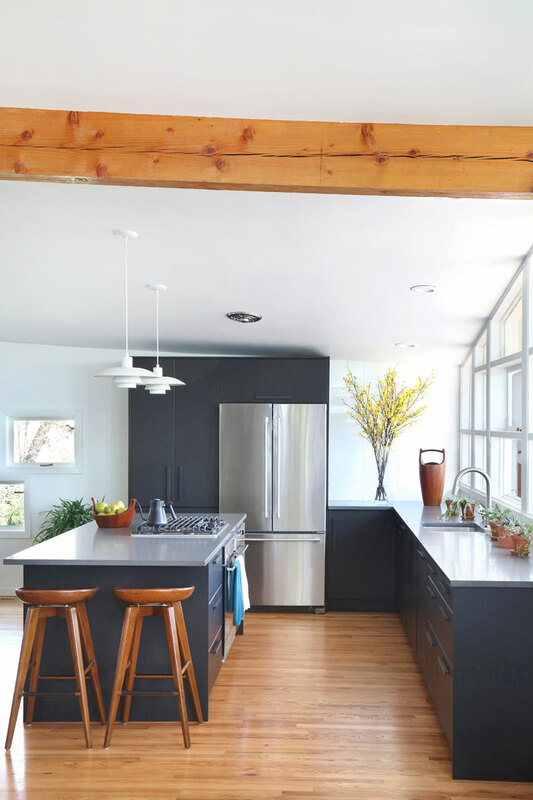 Removing a wall between the kitchen and dining area created an open floor plan which allows for more natural light to flow into the large room. 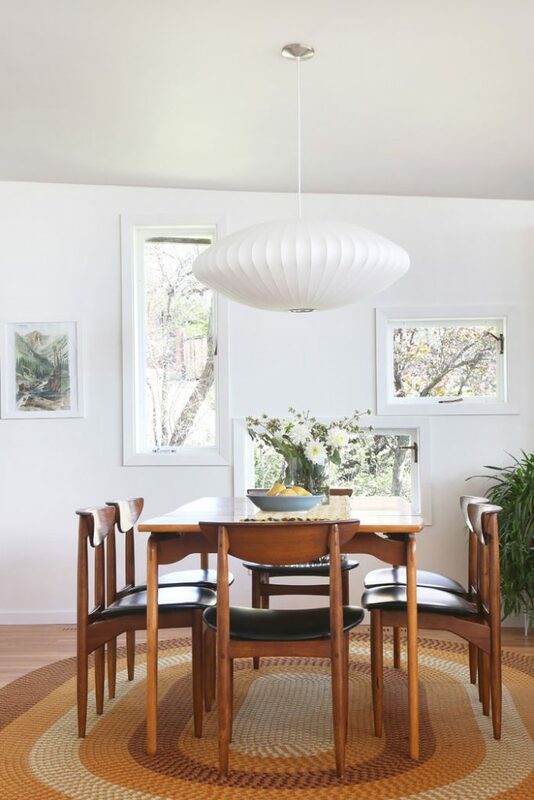 Completely redone, the glossy darker tones of the kitchen contrast the rich wood décor in the dining room. Thanks to old photos from long-time previous owners, the Pattersons, Cole and Danielle discovered the stairs leading up to the living room were originally located near the front door. Centrally located since the prior renovation, the couple notes that the stairs create a welcoming invitation up to the living room. During the house’s early years, the Pattersons created shade for the deck by adding a roof which connects seamlessly to the existing house. “We’re really grateful for it because now we can truly enjoy the space,” states Danielle. “We can use it almost year-round,” Cole adds. 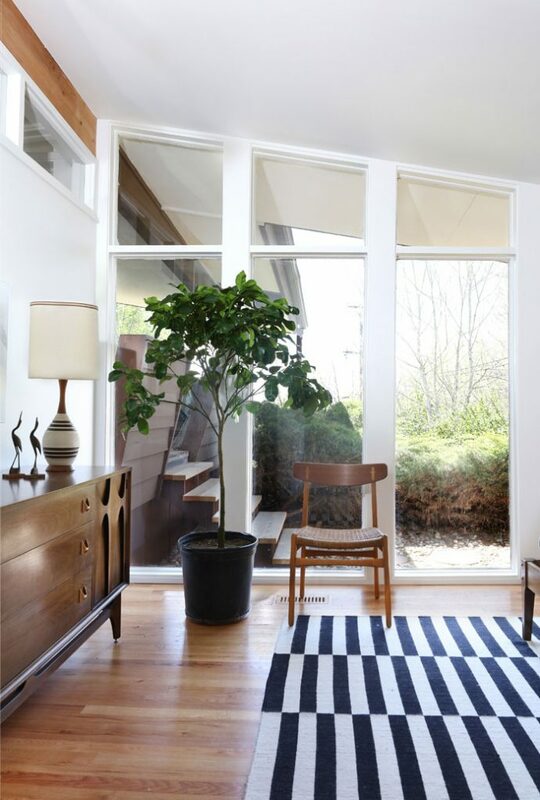 Shutters were removed from the three asymmetrical windows, further enhancing the clean lines of the design. This cluster of windows, already in the home, is mimicked in the nursery. While original to the home’s design, drywall covered wooden beams throughout the house. “We wanted to expose the beams and let them become an architectural feature as opposed to being hidden by the drywall,” shares Danielle. The exposed wood also provides visual breaks in the all-white living room. The removal of a wall allowed for a kitchen island to be added, while the refrigerator and sink were relocated to new areas. Once linoleum and Saltillo tiles, the kitchen floors were redone with “red oak common #1” hardwood, consistent with the rest of the home. While the kitchen still had some original features— including a pink oven and boomerang countertops—the room needed to be gutted thanks to sixty years of wear. “It was really hard for us to decide to take this kitchen out,” Cole admits. 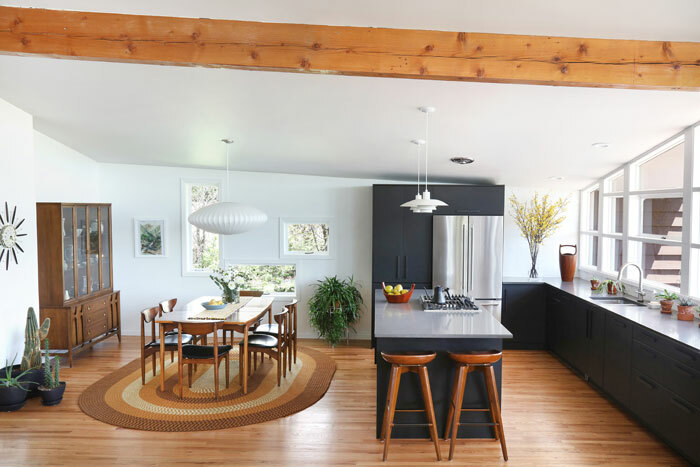 To create a truly open floor plan, a divider was removed between the family room and one side of the kitchen, while a wall was removed on the other side to connect the dining room. Having seen a previous renovation, the guest bathroom needed a complete makeover. Not only did the couple replace all the fixtures, they reconfigured the floor plan so that the tub could be positioned at the back of the room and the toilet next to the vanity. 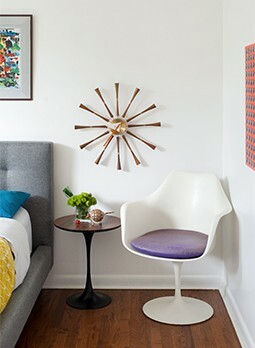 These changes allowed Danielle and Cole to gain a little over a foot of space to the master bath, which is located on the other side of the wall. 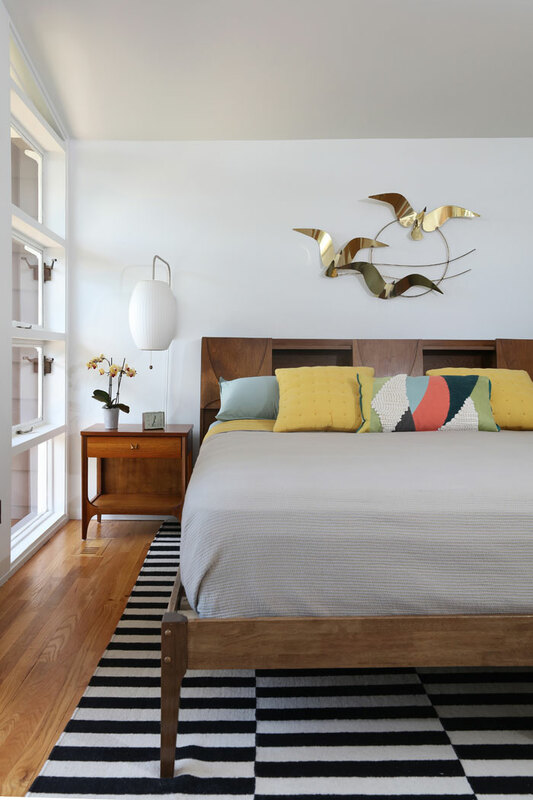 Vintage Curtis Jere birds soar above a rare Broyhill Brasilia bookcase headboard and matching side table. Removing large draperies and an overgrown juniper bush cleared the incredible window work in the master bedroom, allowing for outside access and mountain views. “In our bedroom, we just see the junipers and the trees, and it does feel like a little oasis even though we’re in the suburbs,” describes Danielle.